Establish a normal/effective respiratory pattern with ABGs within patient’s normal range. Be free of cyanosis and other signs/symptoms of hypoxia. Determine etiology and precipitating factors (spontaneous collapse, trauma, malignancy, infection, a complication of mechanical ventilation). Understanding the cause of lung collapse is necessary for proper chest tube placement and choice of other therapeutic measures. Check out respiratory function, noting rapid or shallow respirations, dyspnea, reports of “air hunger,” development of cyanosis, changes in vital signs. Respiratory distress and changes in vital signs may occur as a result of physiological stress and pain or may indicate the development of shock due to hypoxia or hemorrhage. Observe for synchronous respiratory pattern when using a mechanical ventilator. Note changes in airway pressures. Difficulty breathing “with” ventilator and increasing airway pressures suggests worsening of condition or development of complications (spontaneous rupture of a bleb creating a new pneumothorax). Auscultate breath sounds. Breath sounds may be diminished or absent in a lobe, lung segment, or entire lung field (unilateral). Atelectatic area will have no breath sounds, and partially collapsed areas have decreased sounds. Regularly scheduled evaluation also helps determine areas of good air exchange and provides a baseline to evaluate the resolution of pneumothorax. Note chest excursion and position of the trachea. Chest excursion is unequal until lung re-expands. Trachea deviates away from the affected side with tension pneumothorax. Assess for fremitus. Voice and tactile fremitus (vibration) are reduced in fluid-filled or consolidated tissue. Assist patient with splinting painful area when coughing, deep breathing. Supporting chest and abdominal muscles make coughing more effective and less traumatic. Maintain a position of comfort, usually with the head of bed elevated. Turn to the affected side. Encourage patient to sit up as much as possible. Promotes maximal inspiration; enhances lung expansion and ventilation in unaffected side. Maintain a calm attitude, assisting the patient to “take control” by using slower and deeper respirations. Assists patient to deal with the physiological effects of hypoxia, which may be manifested as anxiety or fear. Once the chest tube is inserted: Maintains prescribed intrapleural negativity, which promotes optimum lung expansion and fluid drainage. Note: Dry- seal setups are also used with an automatic control valve (AVC), which provides a one-way valve seal similar to that achieved with the water-seal system. Check suction control chamber for a correct amount of suction (determined by water level, wall or table regulator at correct setting; Water in a sealed chamber serves as a barrier that prevents atmospheric air from entering the pleural space should the suction source be disconnected and aids in evaluating whether the chest drainage system is functioning appropriately. Note: Underfilling the water-seal chamber leaves it exposed to air, putting the patient at risk for pneumothorax or tension pneumothorax. Overfilling (a more common mistake) prevents air from easily exiting the pleural space, thus preventing resolution of pneumothorax or tension pneumothorax. Bubbling during expiration reflects venting of pneumothorax (desired action). Bubbling usually decreases as the lung expands or may occur only during expiration or coughing as the pleural space diminishes. Absence of bubbling may indicate complete lung re-expansion (normal) or represent complications such as obstruction in the tube. With suction applied, this indicates a persistent air leak that may be from a large pneumothorax at the chest insertion site (patient-centered) or chest drainage unit (system-centered). Know the location of air leak (patient- or system-centered) by clamping thoracic catheter just distal to exit from the chest. If bubbling stops when the catheter is clamped at the insertion site, leak is patient-centered (at insertion site or within the patient). Place petrolatum gauze and other appropriate material around the insertion as indicated. Usually corrects insertion site air leak. Isolates location of a system-centered air leak.Note: Information indicates that clamping for a suspected leak may be the only time that the chest tube should be clamped. Prevents and corrects air leaks at connector sites. The water-seal chamber serves as an intrapleural manometer (gauges intrapleural pressure); therefore, fluctuation (tidaling) reflects pressure differences between inspiration and expiration. Tidaling of 2–6 cm during inspiration is normal and may increase briefly during coughing episodes. Continuation of excessive tidal fluctuations may indicate the existence of airway obstruction or the presence of a large pneumothorax. Improper position, kinking, or accumulation of clots or fluid in the tubing changes the desired negative pressure and impedes air or fluid evacuation. Note: If a dependent loop in the drainage tube cannot be avoided, lifting and draining it every 15 min will maintain adequate drainage in the presence of a hemothorax. Useful in evaluating resolution of pneumothorax and development of hemorrhage requiring prompt intervention. Note: Some drainage systems are equipped with an autotransfusion device, which allows for salvage of shed blood. Although routine stripping is not recommended, it may be necessary occasionally to maintain drainage in the presence of fresh bleeding, large blood clots or purulent exudate (empyema). Stripping is usually uncomfortable for the patient because of the change in intrathoracic pressure, which may induce coughing or chest discomfort. Vigorous stripping can create very high intrathoracic suction pressure, which can be injurious (invagination of tissue into catheter eyelets, collapse of tissues around the catheter, and bleeding from rupture of small blood vessels). Observe for signs of respiratory distress. If possible, reconnect thoracic catheter to tubing or suction, using clean technique. If the catheter is dislodged from the chest, cover insertion site immediately with petrolatum dressing and apply firm pressure. Notify physician at once. Pneumothorax may recur, requiring prompt intervention to prevent fatal pulmonary and circulatory impairment. Cover insertion site with a sterile occlusive dressing. Observe for signs and symptoms that may indicate recurrence of pneumothorax (shortness of breath, reports of pain. Inspect insertion site, note character of drainage). Early detection of a developing complication is essential (recurrence of pneumothorax, presence of infection). 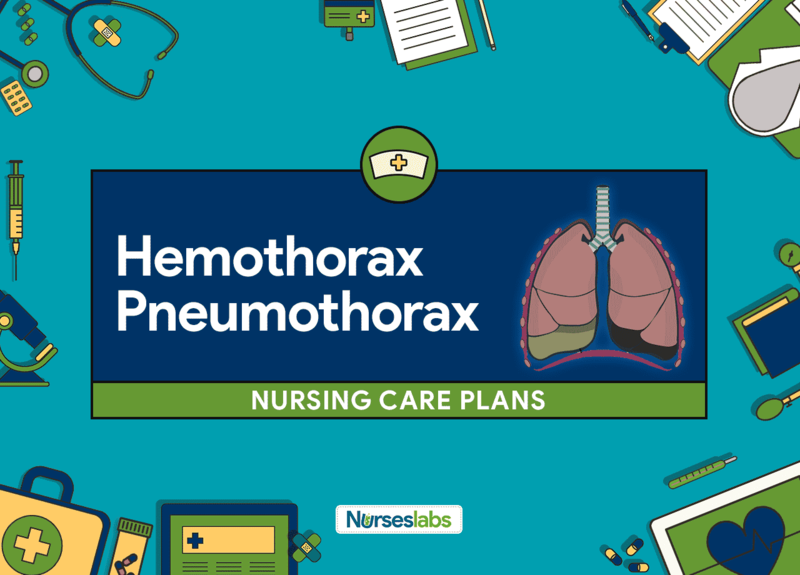 Monitors progress of resolving hemothorax or pneumothorax and re-expansion of the lung. Can identify malposition of the endotracheal tube (ET) affecting lung re-expansion. Monitor and graph serial ABGs and pulse oximetry. Review vital capacity and tidal volume measurements. Assesses status of gas exchange and ventilation, need for continuation or alterations in therapy. Administer supplemental oxygen via cannula, mask, or mechanical ventilation as indicated. Aids in reducing work of breathing; promotes relief of respiratory distress and cyanosis associated with hypoxemia.